Wausau, WIS - The Wisconsin Woodchucks are excited to announce a brand new event for 2019! Brew Fest will be held on the Ascension Terrace on Friday, July 5th during the Wisconsin Woodchucks game. The Woodchucks take on the Madison Mallards that night. Gates open at 5:35pm and first pitch is at 6:35pm. The Brew Fest will feature a craft beer tasting with 12 samples, an all-you-care-to-eat ballpark buffet, Woodchucks game ticket on the Ascension Terrace with an elevated view of the field, and post-game fireworks presented by Trig's. Tickets are $30 for the event. $20 designated driver tickets are also available. Tickets are available through the Wisconsin Woodchucks ticketing department and can be purchased by calling 715.845.5055 or by stopping by the Woodchucks Front Office during normal business hours. The Wisconsin Woodchucks 2019 home opener is Saturday, June 1st. Stay after the game for post-game fireworks presented by Wipfli CPAs and Consultants. 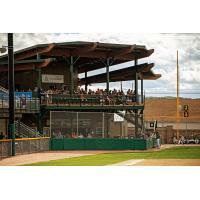 The Wisconsin Woodchucks have many great ticket options for the upcoming 2019 season. Group tickets and tickets packages are now on sale. Order yours today by calling the Woodchucks Ticket Sales team at 715.845.5055 or stopping by the Woodchucks Front Office at 2401 N. 3rd St, Wausau, WI 54403. Single game tickets will go on sale on Friday, April 26th.